If you’ve heard the news about Silverlight 2 Beta 2 and Expression Blend 2.5 (June 2008 preview), you will notice something else in addition to being able to skin your controls easier. Remember how you may have had to create different states for your element using “MouseOver State" and then create storyboards to transition to states? There’s now a better way. Let’s take a look and see if we can simplify this down a bit a basic understanding. Let’s use something that most everyone should be able to relate to with states: Button. A button has MouseOver, MouseOut, MouseDown, etc. states that you can see. Using VisualStateManager and the new UI ability to customize templates, we can make our lives easier. The various states of this control are represented in this particular template. Some other controls might have a blank palette here until some are added, but Button has some default states. As a designer now you can simply concentrate on what the final look of the element (in our case a Button) in each state. Just define the state and what the element should look like in that state. The State palette shows a few things. 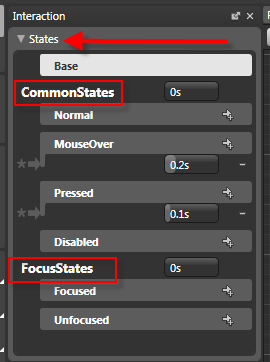 You’ll notice “Base” as well as two other named containers, “CommonStates” and “FocusStates” which are what are called state groups and containers for different states. That’s it. MouseOver will now represent my new state. I didn’t have to create any new StoryBoard elements or anything. This is in part where VSM does some magic. You see, the VSM engine bascially knows the beginning end states between any given transition (i.e., Normal –> MouseOver). The VSM engine automatically handles the transition for us. Think of it as creating a dynamic StoryBoard on the fly and executing it. If we run the application and mouse over the Button, it changes to our state. This controls the duration of the transition TO that final state. The last parameter is to use the transition or not. True would do the transition based on the duration set in that state. False just gets to that state. The theory is that VisualStateManager now makes it easy for us with our skinning, etc., but also separates more from the developer/designer so that the designer can concentrate on the final look and experience of the final states rather than having to code something up. 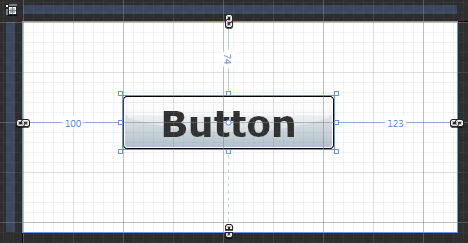 A Button used above is a simple example and I hope it helps demonstrate the VSM class available. There could be other uses than the simple Button of course :-) and I hope to see some creative uses. As a for instance, I've seen a lot of applications with slide-out control panel implementations. You could use VisualStateManager and set the "collapsed" and "open" states for a control panel and just concentrate on the final stages of each and let VSM handle the transitions, etc. For some further designer-driven tutorials on this model, head on over to Nibbles where Celso will have some tutorials on what VSM means to designers in more depth. Also be sure to check out Christian’s blog for more information on VisualStateManager.